Thulani Mbele started part-time farming in the 1980s when he was in partnership with his father who was a small scale farmer in the communal areas. During this period he was working for Eskom. Thulani bought one tractor and his father also had one tractor and some other implements. After planting their fields they used to contract the implements to other farmers who needed help. This is where his love of farming started. Later he left Eskom and moved to QwaQwa in the Free State. He was fortunate enough to lease a 249 ha farm from the previous QwaQwa government. This was a breakthrough as it helped them to grow and make a living out of farming. They farmed with sheep, beef cattle and more or less 30 dairy cows to generate cash flow. They also planted maize, dry beans and wheat, rotating on 100 ha arable land. We received training support in many aspects of farming. There was also a credit facility for inputs and it was very useful. Later Thulani’s father passed away and he was on his own. The opportunity to buy the farm through Land Bank came and the farm is currently paid up and it belongs to the family. In 1995/1996, training assistance was scarce and that forced him to go back to the College of Agriculture to study agriculture. It took him three years to complete his National Diploma in Agriculture. Thulani returned to the farm focussed and prepared to make a success of it. He was fortunate to meet other stakeholders like Grain SA where he attended some short courses like Tractor Maintenance, Welding, different Crop Production courses as well as Calibration of Planters and Sprayers. The training that he still looks forward to receive is related to value adding, packaging and understanding the global markets. Training is very important for one to achieve optimum yields. It helps to minimise costs and maximise profits in many ways. Training contributed a lot to Thulani’s progress and success. When he was helping his father in communal areas, he produced for consumption and a little surplus was sold. 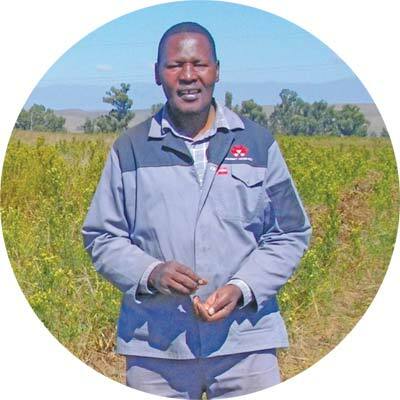 When he moved to his farm he started producing 3 t/ha maize dry land. With the latest technology today they are able to achieve 5 t/ha to 6 t/ha dry land maize. From now on Thulani is working on expansion. His farm is fully utilised to its maximum potential but without compromising the natural resources. They would like to acquire another bigger farm in order to expand. The love of farming always gives him strength and he takes challenges as opportunities to find new ways. It excites him to try new methods and monitor the change and difference. The advice Thulani can give to young farmers is, pursue your dreams, focus, focus, focus and never give up. Article submitted by Graeme Engelbrecht, Development Co-ordinator of the Grain SA Farmer Development Programme.